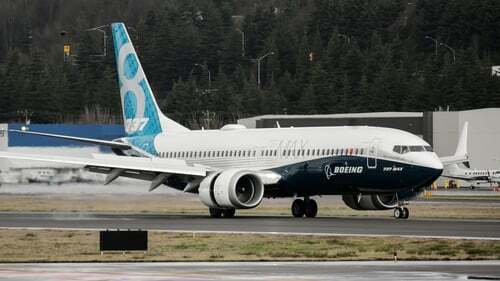 TUI today warned its profit would fall by at least €200m this year after the grounding of Boeing's 737 MAX aircraft, further evidence of the financial impact of two fatal crashes involving the same type of plane. Global airlines and travel groups have had to make contingency plans after 737 MAX planes were taken out of service following an Ethiopian Airlines disaster on March 10 that killed 157 people, five months after a Lion Air crash in Indonesia that killed 189. Tour operator TUI, whose fleet includes 15 737 MAX planes, a tenth of its total, expects flights to resume by mid-July at the latest. Southwest Airlines this week became the first major US airline to cut its financial outlook for the year after being forced to pull its fleet of 737 MAX planes, the world's biggest, out of service. United Airlines and Air Canada have also warned of a hit to their business, with the Canadian carrier suspending its 2019 financial forecasts. TUI said today it was "utilising spare aircraft of its fleet, extending expiring leases for aircraft that were supposed to be replaced by 737 MAX aircraft, as well as leasing in additional aircraft" to soften the blow for travellers. TUI said it now expects underlying earnings before interest, tax and amortisation (EBITA) to fall by 17%, having previously expected the figure to be on a par with the €1.18 billion generated in 2018. It added that EBITA could even fall as much as 26% in 2019 if the planes remain grounded beyond the middle of July. Investigators of the Ethiopian and Indonesian crashes are focusing on an anti-stall system for which Boeing already plans to issue a software fix. No report has yet been issued on the Ethiopian crash but if the so-called MCAS software is found to be the cause of both accidents the planes could be flying again sooner rather than later.